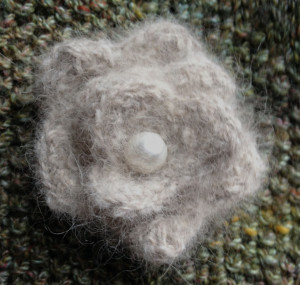 Fur in Bloom: dog hair flowers - Knit Your Dog! Small dogs don’t shed enough to make anything…or do they? Don’t even THINK of trying to brush this. something, nobody liked something. Fuzzy hated brushing. He hated it enough to draw blood. So over the course of Fuzzy’s far too short 13 years, I only collected a few handfuls of that resplendent fur. I have a mere 56 yards to show for over a decade of attempted brushing. That’s about enough for a coffee cup sleeve and a half. Not a lot to remember him by. But have a look below. What about a flower, set as a brooch, that blooms all year round? I love my Chow Chow pullover, and it’s the only thing that makes the polar vortex bearable, but it’s too warm to wear any time outside the polar vortex. A brooch, in contrast, can be pinned anywhere you like, any time, any season, making dog hair flowers a year-round option. I made this brooch as a pin for a lovely lace Juliet scarf from Keeshond wool. A simple flower, it knits quickly with very little wool, only a couple of yards, and measures 3″ in diameter. I estimate I could knit 10 of these with what I have from Fuzzy. This is one, very simple example. There are loads of ways to knit small decorative elements, and even more ways to crochet them. They are easily attached to pin backs, hair pins, barrettes, and plenty more that I will think of as soon as this missive has posted. I would love to hear your ideas and suggestions, so please submit your comments below. I know that some people become uncomfortable at the thought of anything made from dog hair. I also know that most of these same people have no problem wearing items made from sheep or goat hair, but for whatever reason, are more comfortable about a sheep they’ve never met than a dog who has been loved and cared for and whose hair is humanely collected. For dog lovers looking to always have a memento of their beloved canine with them, I find this is a spectacular way to wear your dog on your sleeve (or lapel, or wherever) without drawing negative attention or heaven forbid wrath! flowers, not much hair, year-round. Bookmark. 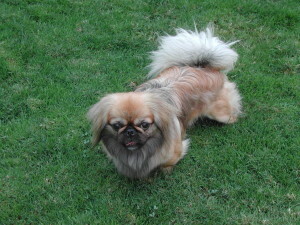 Pingback: Harvest Time: Spring into Saving Dog Hair! - Knit Your Dog! How much hair would you need for a infinity scarf? Joni, that would depend on both the dog’s fiber and the length and width you desire (2 loops around or 3, flat, tubular, and how wide. The first step for any project would be to process a sample of your dog’s hair. Click the Contact Us tab to message us for more information! I love the flowers. I’m asking for some to be made to adorn the dog fur blanket I will soon have made. I’m very excited about this. Have you ever considered making dog dolls with fur? I’d love a stuffed dog toy that looks like my Samoyed and is made of his fur. My shepherd mix has great fur that could make the stuffing. Tiny toys would make great Christmas tree ornaments. Actually, I have been toying with this idea when I have time. I’m hoping to get a blog post together on this topic soon.